With stunning views, a fabulous location, and gorgeous interior, this is the perfect getaway home for family and friends. We have provided a place that has great living space both indoors and outdoors for maximum enjoyment. The view is stunning, with sunny southern exposure overlooking Burgess Creek. In the summer, the decks are shaded by aspens, and in the winter the sun fills the home with warmth and light. We have two decks and lots of patio furniture which really increases the living space in the summer. In the winter, if the kids aren't worn out enough yet from skiing, there are lots of ways to stay busy right out the front door! The indoor living space is laid out very well. The kitchen is gorgeous and has a nice large breakfast bar which is great for socializing or making meals together. We have stocked it with basic cooking needs, condiments, and coffee which we share with our guests. The main living area is very comfortable with a large sectional sofa and recliner. The fireplace is cozy and adds a nice ambiance to the room. There are large windows great views and quaking aspens. The two bedrooms upstairs both have their own bathrooms, very large closets, and amazing views. The bedroom downstairs has two twin beds and a half bath. We are conveniently located close to the ski area, and the bustop is just a short walk away. The bike and walking path is very close by and just down the road is a park for fun family outings in the summer. The neighboring units are owner occupied, which ensures you quiet accommodations. Renting a townhouse means that no one is above or below you, and ensures easy access as you are bringing in your gear. No need to haul your skis, boots, and supplies across parking lots, upstairs, and down long hallways. 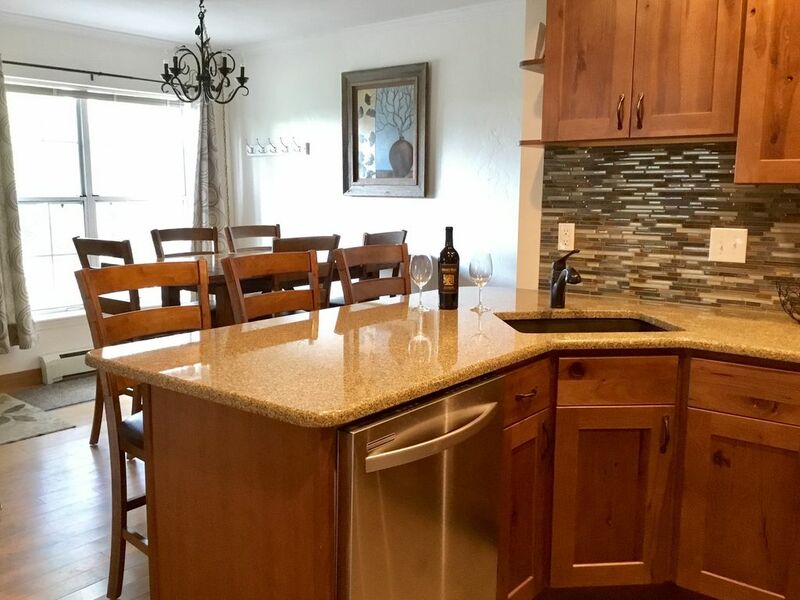 We have given great attention to details in our renovation and you will enjoy a gorgeous new kitchen with stainless steel appliances, granite counter tops throughout, slate, tile, and hardwood floors and new, comfy furniture. We have tried to make our unit very user-friendly by making sure all the little extras are there that you will not find in a 'Management Company' unit. We supply books, games , puzzles , maps and many other basics that guests will find useful. We are very familiar with the area and all it has to offer, and can help you plan your activities while in Steamboat. If you would like to check the location in your favorite mapping program, the address is 1200 Sparta Plaza #5. Please, 4 night minimum during the ski season. Janice and Larry began their Steamboat adventures in the 1970's and have owned a place here since 1986. They love all the fun outdoor things Steamboat has to offer. They taught their children to ski here and are now thrilled to be introducing their grandchildren to the sport! They want to share the Steamboat magic with their guests and provide them with the best vacation experience possible. We have been property owners in Steamboat since 1986. We recently bought and renovated this unit due to its fabulous location, gorgeous views, private deck and outdoor living space. Guests will enjoy the quiet yet convenient location, just steps away from the bus which is great in the winter for skiers. It is an easy walk to the base in the summer with beautiful Walton Creek views across the street. It has lots of windows overlooking the valley with two decks shaded by aspens. Since our place is a townhome rather than a condo there is no one above or below you. You don't need to carry your gear up and down steps as you would in a condominium. It is very quiet with few shared walls. We have an amazing outdoor living space instead of a small deck overlooking a parking lot like you would find in condominium. As our realtor said, "You have a little slice of Steamboat heaven in this gem of a place you bought." Gorgeous view from cozy couch. Brand new 5 burner gas. We always provide coffee filters and coffee for our guests. We stock it with the basics; spices, olive oil, etc. Beautifully remodeled with granite countertops, high end cabinets, new floors, and large seating area open to dining room. Brand new mango wood table with leaf, so it can seat 6 or 8. Child's booster seat in unit. Beautiful views. Large HD TV in living room, smaller one in master bedroom. Two brand new decks with lots of seating and great views. Great southern exposure overlooking Burgess Creek with nice aspens for shade. We really enjoyed our weekend stay at this lovely home. It was very well equipped, and close to everything we needed in Steamboat! The owner was most gracious, and communication was great. We would not hesitate to stay at this gem on our next visit to Steamboat! My guess is that it’s the best value in town. Great house for 6-7 people! The house is everything you need for a ski weekend. It has a great kitchen and three bedrooms with a pullout couch in the living room. It is clean and spacious. There is a convenient free bus that takes you straight to the steamboat resort. Great location. Loved the layout. Best place we’ve stayed in six visits to Steamboat. The layout was perfect for our party of two couples and a single adult. Easy access to Gondola Square. Owners very easy to work with. Highly recommended. Very clean, comfortable, and modern. The townhome was comfortable for six people. It had a wonderful kitchen, fireplace, and floor layout. The one downside was that the hot tub was quite a walk & it wasn’t near hot enough. It was easy to catch the bus and take the short ride to the ski mountain or downtown. The owners were very good about responding to our questions. Would definitely recommend! We’re so happy you enjoyed your stay! We have let the management company know about the hot tub temps. This Townhome was clean and very conveniently located. The Green Line bus was less than a minute away and takes you right to the slopes. It also can turn into the red line if you want to take it all the way Downtown from the base of the Gondola. Basic spices and cooking supplies were provided and there were ample dishes for 6 or more people. The towels seemed brand new, and the kitchen seemed to be recently updated. There's a fireplace and shoe rack to keep your boots dry and warm, and the windows provided ample light. Would definitely stay again! We’re glad you enjoyed your stay at our townhome. We have done our best to provide our guests a quality experience. Our property is located near Mt. Werner and the ski area. It is an easy walk to the base area in the summer, and there is a shuttle bus as well. There is lots to do at the base in all seasons in addition to skiing. We overlook a scenic creek, and there is a bike/walking path that takes you all the way into downtown Steamboat via the beautiful Yampa River.